I see you’re ready for your culinary rite of passage! Now don’t get scared! Smoking is one of the most rewarding styles of cooking, and easily the most versatile meat to use is chicken. If you’ve never smoked whole chicken before, you might be a little nervous. Don’t be! I’m here with you every step of the way. 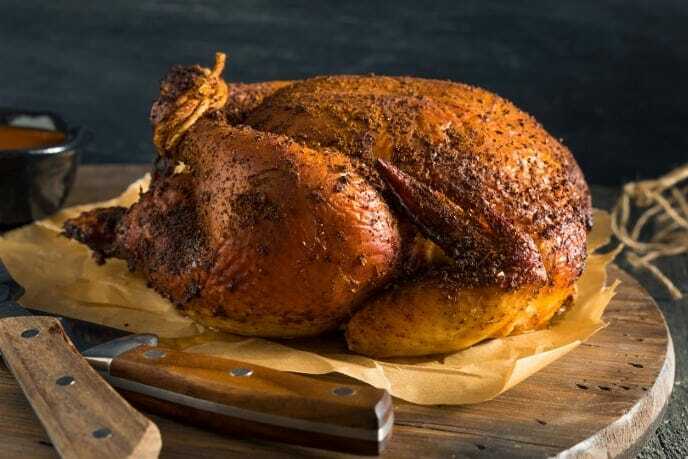 In fact, so many people shy away from smoked chicken, under the impression that it’s not worth the effort and is more difficult than it actually is. Ain’t nothing to be afraid of here though. I promise you’re not going to need your work boots for this recipe. I know growing up, the best part of any holiday was when someone showed up with a foil pan with a smoked chicken in it, because there is nothing else on the buffet table that can compare to the succulent, dark flavor that you create. Even the skin is cooked to crisp, melt-in-your-mouth perfection. Have I been guilty of taking all the skin because it’s just that good? Don’t judge! You would (and probably will) do the same. 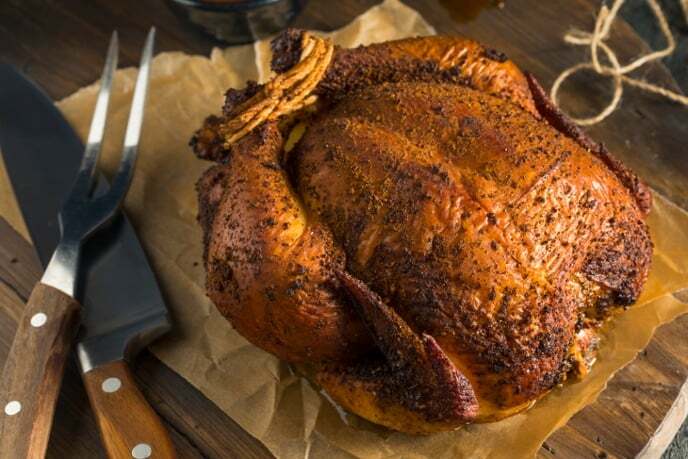 Smoked chicken is definitely going to be the star of the show for your work’s potluck, family holiday feast, or just to show off for your sweetie. Because while chicken is always a winner, smoking the meat just adds that little bit of pizzaz! And there’s nothing more glamorous than showing off how you cooked a whole chicken to mouth-watering perfection. P.S.A., this can go a long, long way — not just to add a rustic, verbose flavor to whatever you have planned, but also for all the leftovers! Raise your hands if you love to open your fridge and see flexible leftovers. Yeah, I see a lot of hands. You can easily translate this into tacos, mix it up with some broccoli and pasta, add it to a grilled cheese with a little bit of pesto. Even throw on some fresh bacon crumble and put it on top of a bright salad! And I guarantee your kids will never complain about leftovers when this is what you dish up. I know, my mouth is watering, too! My favorite thing about smoking chicken is that it’s super low pressure on time. There’s no rush to any of the steps. The day before you plan to cook, go ahead and brine your chicken. That just means dissolving salt and other seasonings in water, and letting the chicken rest there, usually overnight. This will help the flavors get deep into the meat, as well as tenderizing it. If you’re using a flavor injection, do it a few hours before you plan on cooking. I keep the leftover injection mix to baste with throughout the cooking time. Everyone loves the flavor smoking chips give — but did you know that fruit and nut branches add their own unique flavors? 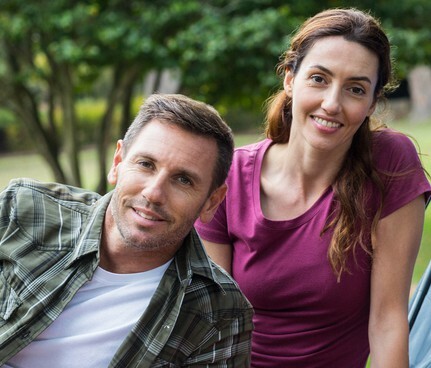 Check around with local orchards to see about getting some apple, cherry, or almond tree branches to throw into the mix. Soak your wood chips in water for an hour or so. This will ensure they smolder and smoke rather than just catching fire and burning out. Plan on letting your bird cook for between 3-5 hours. Cook time will vary by the size of the chicken, and what temperature you set your smoker to. For a crispier skin, take out of the smoker when the internal temperature is at 145°F and move to the oven, where it can cook on 350°F for about half an hour, or until we reach 165°F. Here’s one of my personal favorite recipes for smoked chicken. This recipe is simple but classic, and utilizes just a dry rub so it's a great way to get your feet wet before giving injections a whirl if this is your first time trying to smoke meat. Mix the water, peppercorns, salt, syrup, and mustard seeds in a sauce pan. Bring everything to a boil and continue to do so until the salt dissolves completely. Put your chicken in a large, resealable bag. Add your cooled brine, the beer, and onion and garlic. Seal the bag, forcing as much air out as possible, and refrigerate for at least eight hours, although preferably overnight. Remove the chicken from the brine and pat dry, inside and out. Mix the ingredients for the rub. Gently loosen the chicken skin, and rub the spice mixture under and on top of the skin, and the inside cavity. 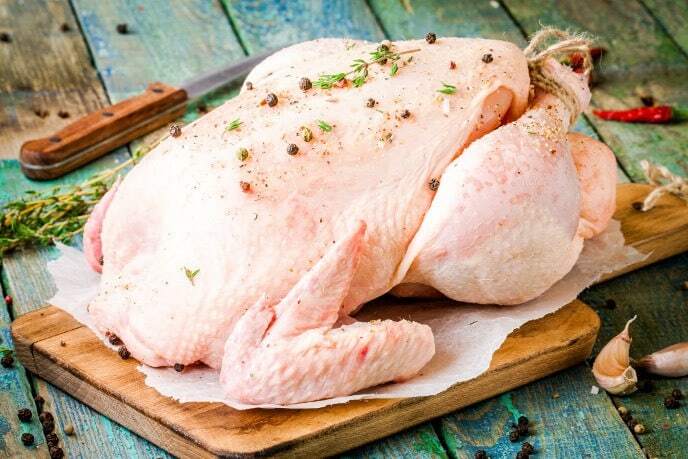 Wrap the chicken tightly with plastic wrap and keep refrigerated for at least 4 hours. 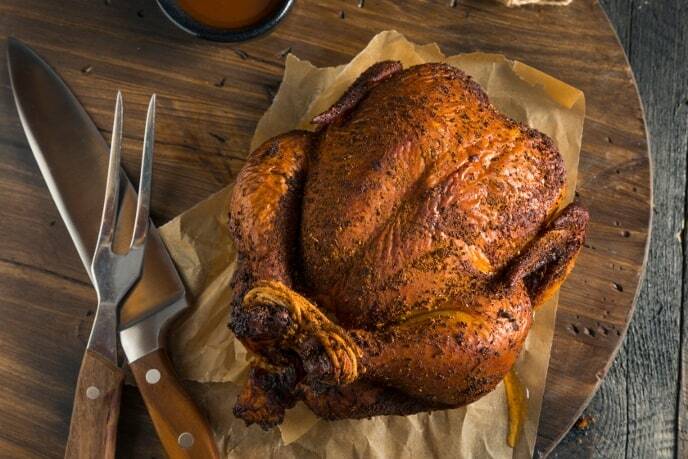 Unwrap the chicken and place in a prepared smoker. Smoke at 225-250°F until your meat thermometer reads, at the thickest part of the breast, 165°F. Remove the chicken from the smoker, tent a piece of foil over, and allow to rest for at least 10 minutes before serving. Bon appétit! Go ahead and pair the fruits of your labor with some amazing mashed potatoes, pasta, dried fruit, or a side salad for a truly robust meal. Hi! With re. to “1 Pc Yellow Onion (Rough chopped)”, what does “Pc” mean? I love anything smoked and would love to try this, however I do not have a smoker. My gas b’que is new and has a thermometer so I could try keeping the heat low by turning off burners. But what do I do with the wood chips to get them to burn/smoke? Soak the wood chips for about an hour. Then wrap it with aluminum foil and poke several holes. I would place this towards the back corner of your grill as that area tends to be the hottest. Be patient with it but it will produce smoke. This is an awesome recipe! Daughter said its the best chicken shes ever had! Your right about the skin too, just as good as bacon. Hooah!